Jenny of ELEFANTZ: Christmas...well sort of. A while back I was sent some lovely new Scandi Christmas fabrics and in the bundle were a couple of panels. I really like the icy grey and rich red this style of design displays and wanted to incorporate as much of a balance between the two colours as possible. Now you know I'm a stitchery designer, not a quilt designer, right? So what did I choose to make? Yep, totally out of my comfort zone, or out of my tree and off my rocker as hubby might say. 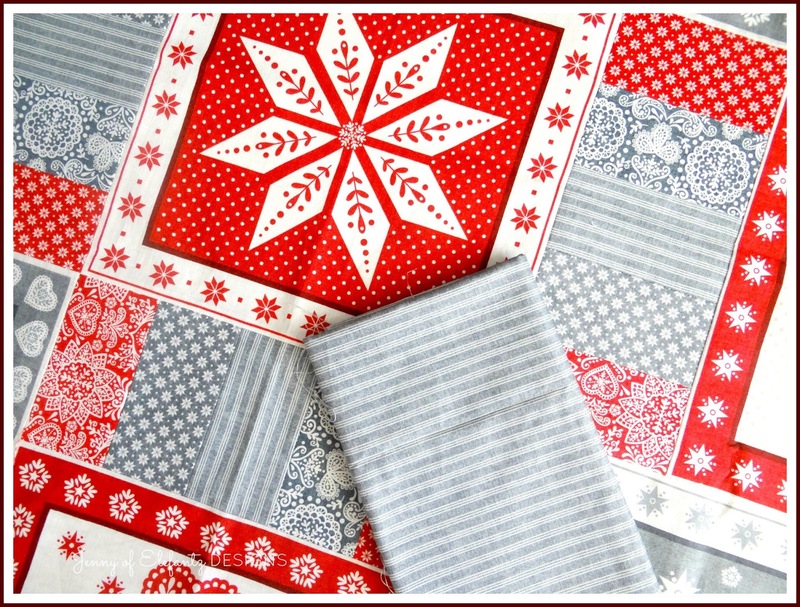 The fabrics are a mix of small and medium scale wintry prints plus a beautiful grey stripe which I thought would make the perfect binding. 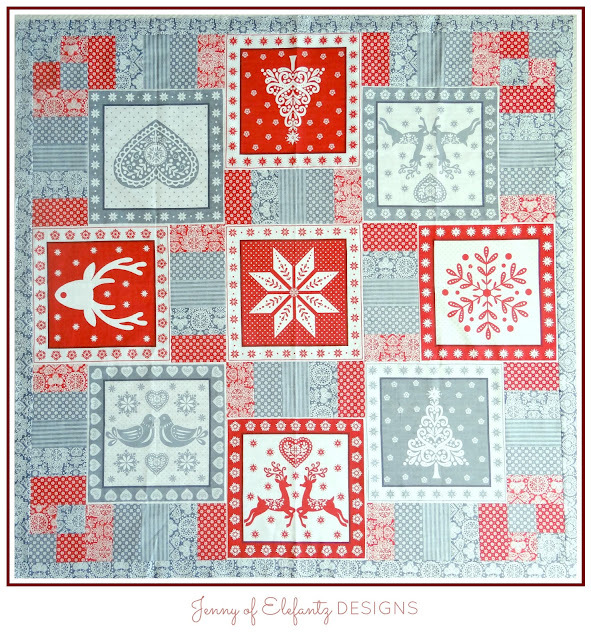 I chose to use the red snowflake panel as the centre and create the rest of the quilt as I went along. Talk about winging it! ...before adding more of the five feature fabrics and more red panels. The photo below was taken with the flimsy laid out on my bed and is a good representation of the colours, but I love the photo above because it was in the moment at the front entry way with my little 5'1" self balanced on a chair and leaning as far over the quilt top as I could without falling face first onto it! 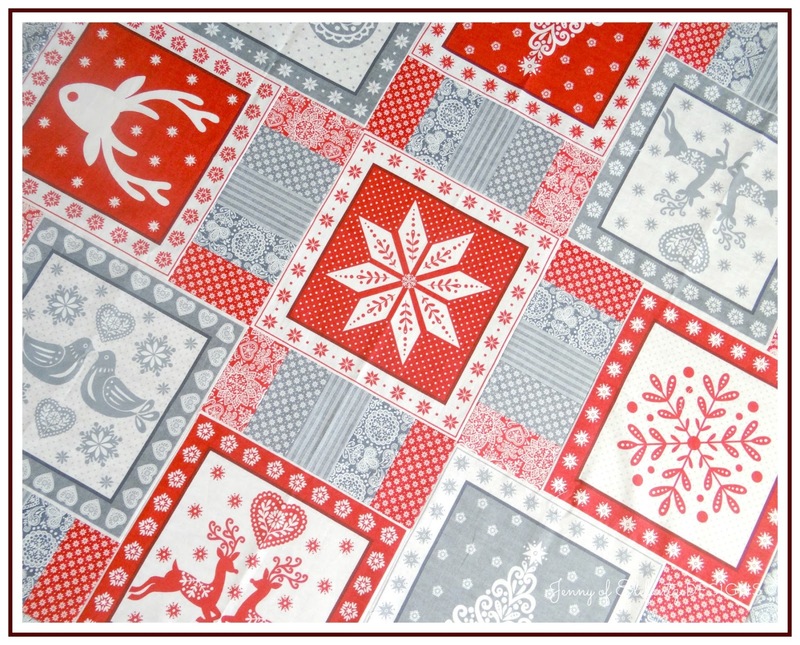 The fabrics are by Makower UK and if you'd like to see the whole range go here to their site. I've been told you'll find them in quilt stores worldwide right now...just in time to sew for Christmas! 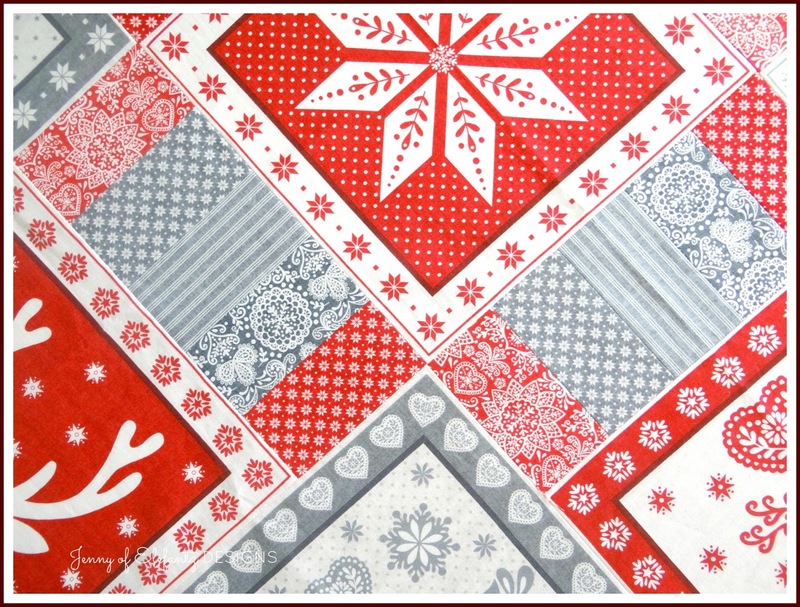 I hope to machine quilt and bind this flimsy very soon, the plan being to lay it over the table on Christmas Day. How very unlike me to be planning the decorations so far in advance...may have to try this every year! Now tell me, are you sewing for Christmas already? What are you making and do you have a colour theme? I am just about to get our church ladies working on this year's Christmas Tree Decorations in time for the local Festival in December. But unlike the last 2 years, this year's offering will be knitted not stitched. They are always amused when I go on about Christmas in July! I love the Scandi quilt. It is often when we relax that the right brain works better. This quilt is gorgeous! I do love the colours and you have a knack for knowing how colours work well together. How big is the quilt? I have started making Christmassy things for Christmas gifts to blogger friends. I love using Cottage Garden Thread colour called Mistletoe for the stitcheries and then I tend to match the fabric colours to that. I do, however, like the idea of purple and silver together for Christmas but haven't used that combo yet. Having now seen your lovely quilt I am rather tempted to find that particular fabric to make something for myself. Just one thing......please find another way of taking photos! At least have Mr E standing behind you and holding you. No ladders and no chair climbing girl! ( I know how difficult it is as I am shorter than you LOL). Just beautiful combiinations Jenny. Apologies but I did laugh at the thought of you balancing on your chair leaning over to take the photo !!! The lengths we all go to for that perfect pic ............. :-) I so look forward to seeing this all finished & on your table. Just gorgeous. My Swedish mother would love this. Have you seen any Dahla Horse fabric? I would like some. 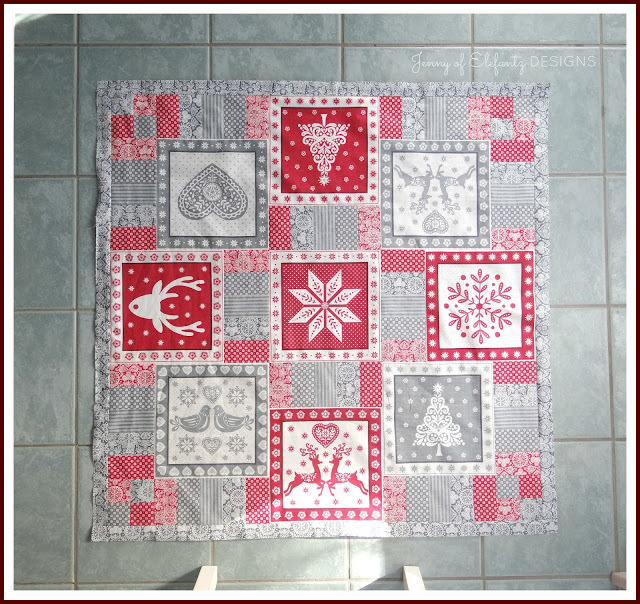 I have been visiting over at Sarah's Christmas in July blog hop. I think this is the 5th or 6th day, I have found several tutorials and patters I'm going to use for gifts this Christmas and I'm starting today. No Christmas rush for me this year. You might want to visit. I hope it is a working link. Simply gorgeous! You should get out of your tree and off your rocker more often! You did a great job with your quilt design. I went and looked at the fabrics and I also think this would be great in Red and Gold. I haven't started on any Christmas things yet--too much else going on in my life right now, but have been looking at ideas. Oh this is just lovely Jenny! Very pretty colours and set out Jenny. Giggled a lot about how that photo was taken and you balancing!! Oh that fabric shouts quilt Jenny. It's beautiful. Love the image of you taking that photo. those are some beautiful fabrics. they really do look scandanavian! you've done such a good job on your quilt. Your quilt top looks beautiful, Jenny. It sure doesn't look flimsy to me. Thank you for sharing.